Since I’m doing some experiments with my OpenWeatherMap LUA based client on the ESP8266 running the Nodemcu firmware, I’ve bought a BMP180 sensor. The thing is that even starting with 30K of free heap on the Nodemcu firmware it is almost impossible to run all the code for querying OpenWeatherMap Json interface, driving the 16×02 LCD AND also using the bmp180 sensor for local data. So if using the bmp180 LUA libraries that are available and seem to work for everybody except you, and me ( 🙂 ), check and double check the connections. My ESP-01 board has not being used for a few weeks due to other projects, and today, after updating my local nodemcu firmware repository I’ve found out that the latest build directory where the binary for the firmware was located was gone. If by any chance you are having second thoughts in providing your e-mail, use one from Fake Mails and wait for the firmware on the provided (temporary) e-mail. Put the ESP8266 into firmware flashing mode by connecting the GPIO0 to ground and reset the board or power cycling. We can only publish again in a MQTT topic if, and only if the previous topic call has finish. That’s why we need to use a semaphore to stop multiple publish request at the same time. MQTT based code consumes a lot of heap. So much, that to make it work I have to strip empty lines and comments from the code. It seems that the latest NodeMcu firmware does have a node.compile() function that we can use. Using unbound arrays for storing MQTT messages while waiting for their turn to be publish, will end up using all available heap space, and the esp8266 will reboot, because setting previous array entries to nil won’t free the used space at all. Doesn’t check if the buffer is full, it will just overwrite any older unpublished messages. Entries on the buffer have no QOS defined. Has no “intelligence” for example to only override messages with QOS=0 that might get lost anyway, and keep QOS>0 messages. That would mean that eventually the buffer might get full, and all publishing from the user code can fail. -- Configuration to connect to the MQTT broker. print "Connecting to MQTT broker. Please wait..."
Apparently this code can run for a long time. Also at the beginning I print the heap space before running and connecting to a MQTT broker. A bit better. Not much, but makes a difference. Since a small code as the above can fail to run due to lack of heap space, solving some of the issues that I’ve referred on the beginning of this post might only be feasible if really needed. Let’s see if I can improve this. So I’m messing around with ESP8266 and the NodeMcu firmware that uses the Lua language. The fact is that I’m hitting some limitations that are hindering development of something more complex than simple web servers or anything else for that matter. Limitations like it can’t be a network server and a client at the same time, no network sockets, like opening up a socket to a server and keep that connection open a use it across Lua files, makes building things much harder when in fact this is a communication centred device… So at the end for more complex projects the native SDK and using the C language is the way to go. Setting up the Apache Web Server: First make sure that you have Apache with PHP installed (for this hack I use PHP because it was already installed and configured). In my case, the Apache document root directory is /var/www . So I needed to do chown www-data /var/www/data so that Apache can write data to that directory. Just make sure that you add a new line at the end of this line. And that’s it. Every single minute an esp8266 timer triggers and calls the above ping.lua file that makes the espdata.php store the current heap size in the esp8266heap.csv file. 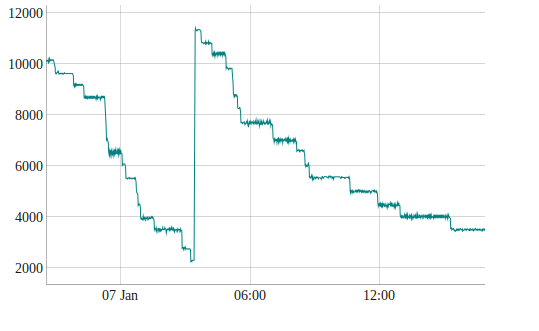 We can see where it is heading… The sharp change at around 3AM was the NodeMcu reboot.